The microcontroller used in this project is PIC16F877A and the shift register is 74HC595 but other serial-in parallel-out types can be used such as 74HC164 or HEF4094. 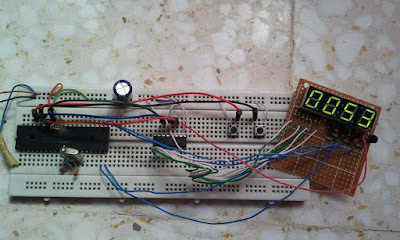 By adding a shift register we can make a cheap serial LCD. The following image shows project circuit schematic. The shift register data line is connected to RB0 pin and the clock line is connected to RB1 pin. LCDs enable pin is connected to pin RB3. 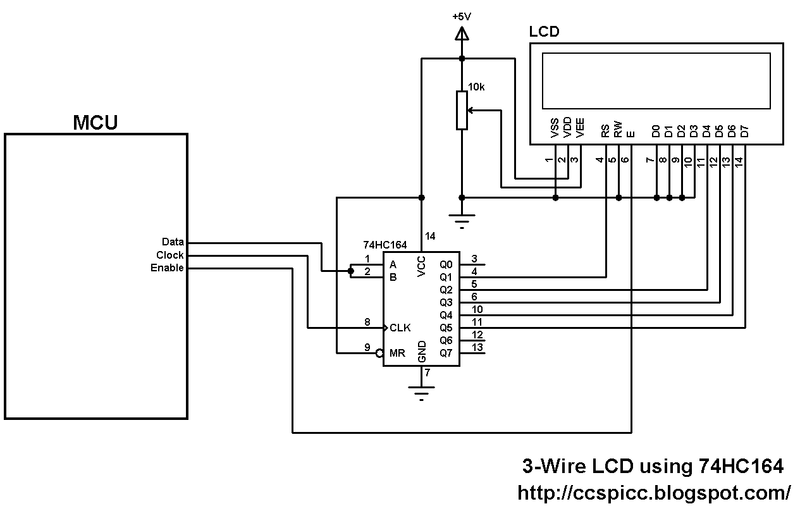 The LCD can be 1602 or 2004 or any compatible LCD. 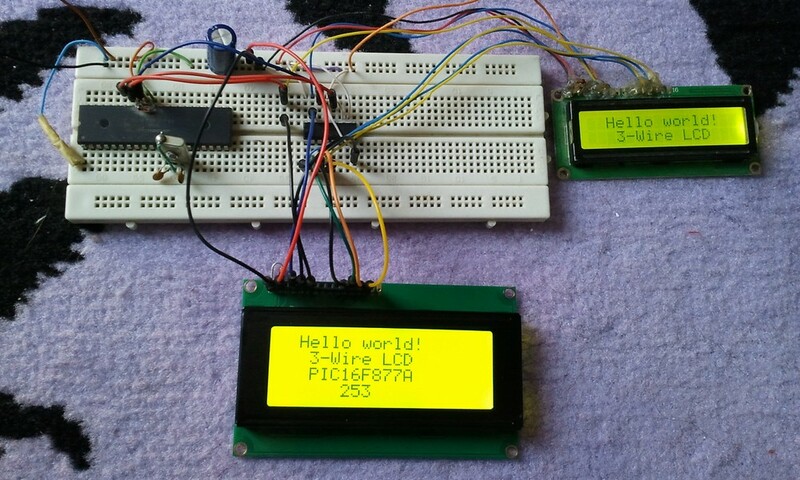 The following video shows a prototype hardware circuit of the project where a two LCDs (1602 and 2004) are used and connected in parallel. Generally the LCD display needs at least 6 data lines to operate. But there are some microcontrollers don't have this number of available pins like the PIC12F family, which means that we have to find a solution to decrease the number of pins used by the LCD display. The idea is sending data serially to the LCD display via shift register, this shift register is serial-in parallel-out which receives serial data from the microcontroller via two pins data pin and clock pin. 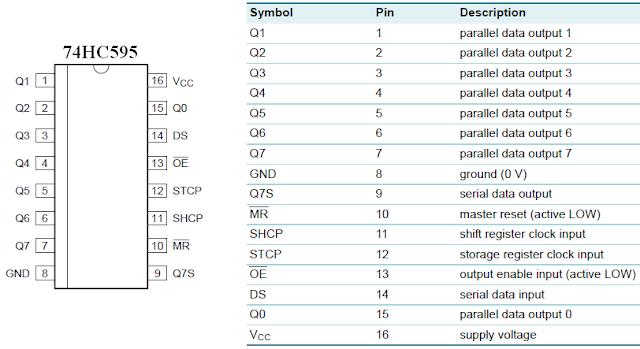 Any serial-in parallel out shift register can be used for example: 74HC595, 74HC164, CD4094 (HEF4094)... Circuit schematics are below. This is the full C code of the driver. This driver tested with 1602 (16x2) LCD and 2004 (20x4) with crystal frequencies 8MHz and 48MHz. It is easy to add this file to your project just put it in your project folder or in the CCS PIC C driver folder. LCD_Initialize(); // Must be called before any other function. LCD_Out(unsigned int8 LCD_Char); // Display Char on the LCD. LCD_RETURN_HOME Return cursor to home position, returns a shifted display to its original position. Display data RAM is unaffected. The hardware circuit is simple all what we need is a shift register (74HC595, 74HC164, CD4094). 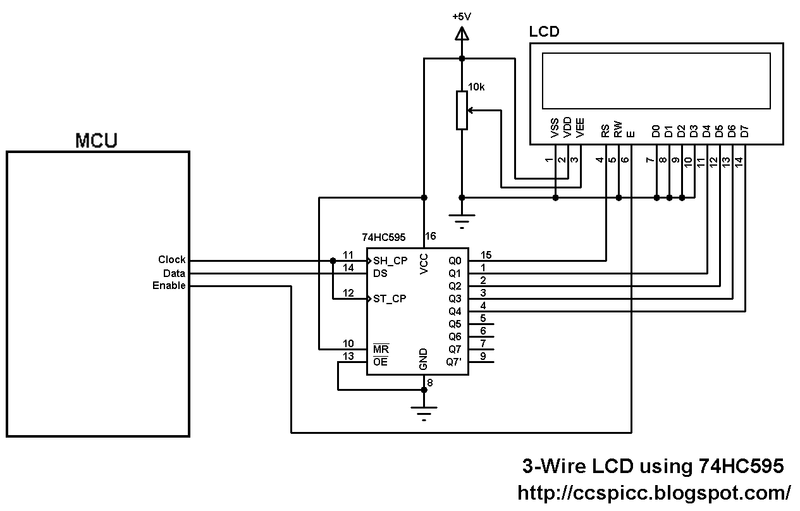 The following circuit schematic shows the connection circuit between the LCD, 74HC595 and the microcontroller. 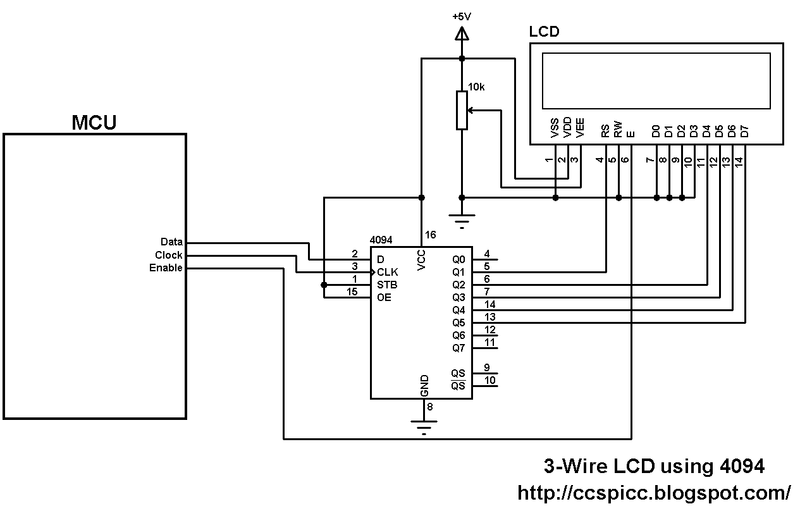 The following circuit schematic shows 3-wire LCD connection using 74HC164 shift register. 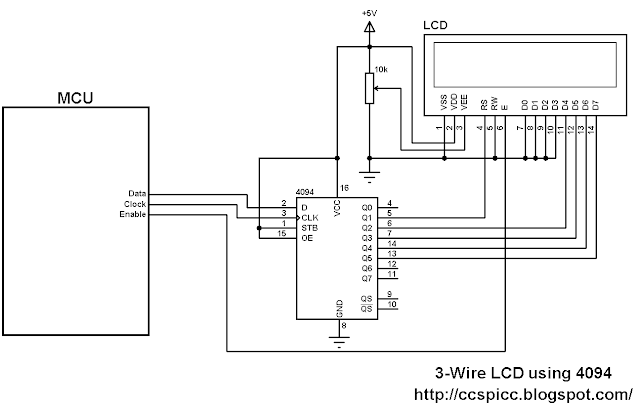 The following circuit for LCD display connection with HEF4094 shift register. 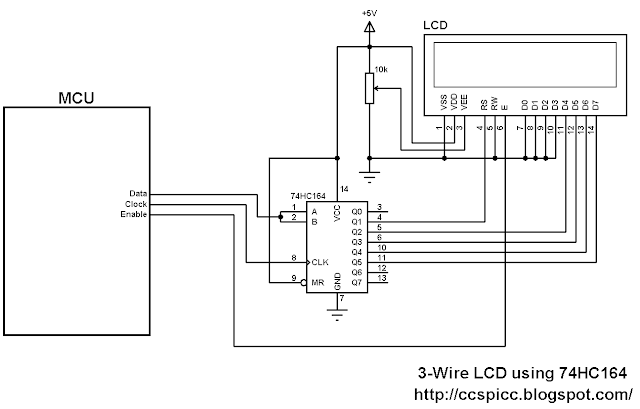 The following URL shows how to interface PIC16F877A microcontroller with 3-wire LCD. There are many topics in this blog talking about the 7-segment display and how to interface it with different types of PIC microcontrollers. One of these topics shows how to interface PIC16F877A with a multiplexed 4-digit 7-segment display with the shift register 74HC164N. 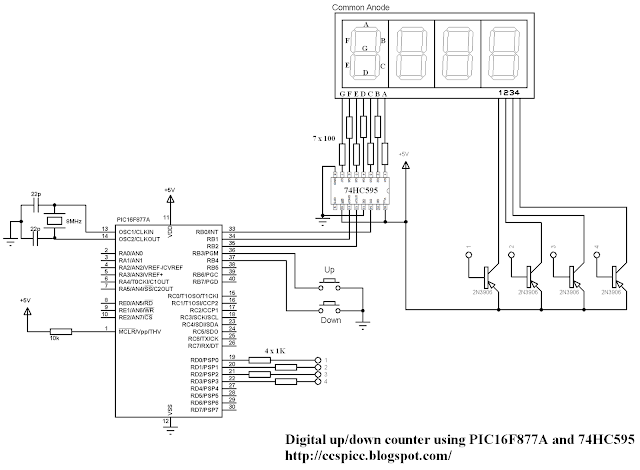 In this topic we are going to see how to make a digital up/down counter using multiplexed 7-segment display with 74HC595 shift register and PIC16F877A microcontroller. From the 74HC595 datasheet this shift register is a high speed, 8-stage serial shift register with a storage register and 3-state outputs. The registers have separate clocks. The following circuit schematic shows a multiplexed 4 digits connected to the 74HC595 shift register. The type of the 7-segment display used in this example is common anode. In the circuit there are two push buttons, these buttons are used to increment and decrement the displayed number. Here is the example code I think it is a small and clear code. The following video from a real hardware circuit for the digital counter. 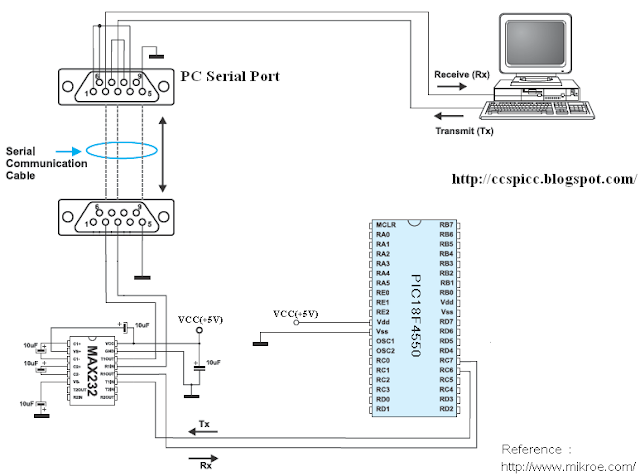 This article shows how to get started with PIC18F4550 microcontroller USART module using CCS PIC C compiler. 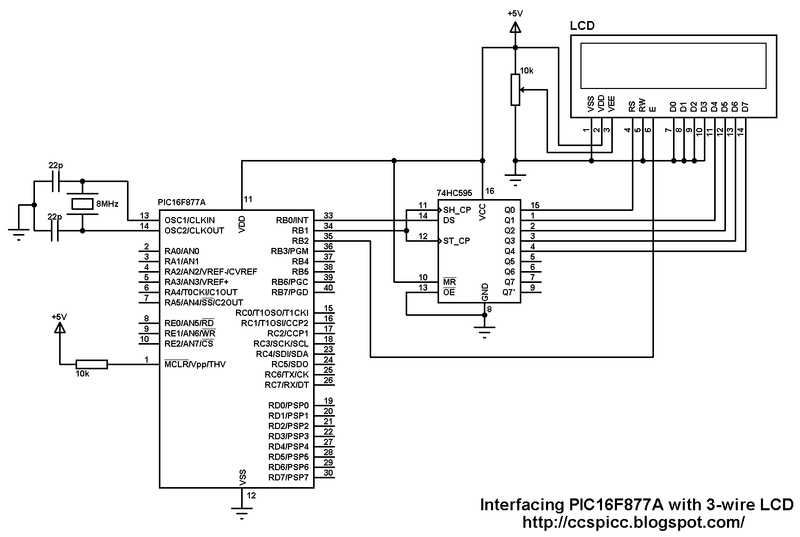 PIC18F4550 microcontroller has one (1) USART (Universal Synchronous/Asynchronous Receive/Transmit) module. This module can work in USRT mode or UART mode. In this topic we are going to use the USART module as UART (Universal Asynchronous Receive/Transmit) to transmit and receive data between the microcontroller and the computer. Pin RC6 (TX) and pin RC7 (RX) are used for the UART (serial) communication between the microcontroller and the computer. To change between TTL logic levels (5V) and RS232 signals (+/-12V), an IC is needed which is max232. Don't connect TX and RX pins directly to an RS232 serial port which may damage your microcontroller. This is the full C code of this example. The following video shows communication between the computer and PIC18F4550 using UART module. 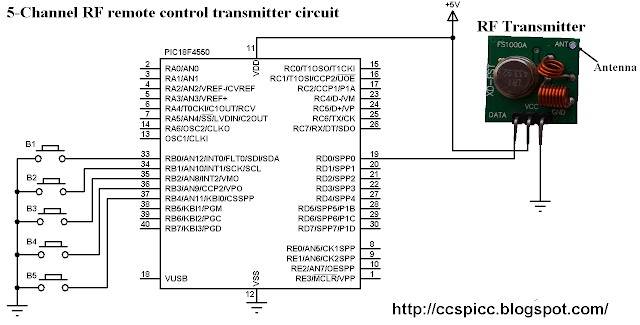 This is a small example shows how to use PIC16F877A UART module using CCS PIC C compiler. 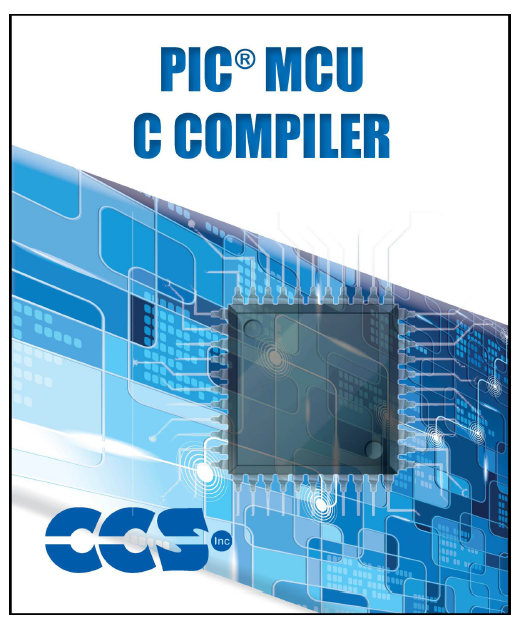 CCS C compiler serial monitor can be used to communicate with the microcontroller. This is the full C code for this example. Today RF modules are widely used in many applications (wireless data transmission, quadcopter, car remote control....). 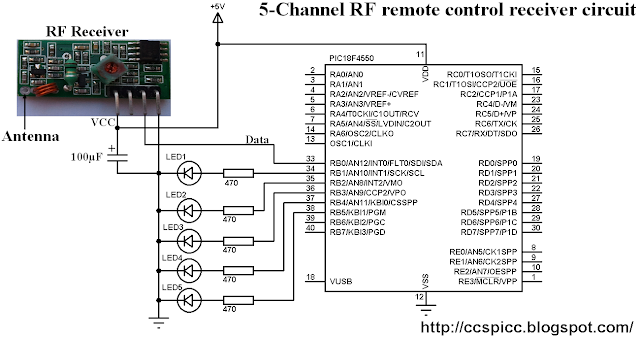 This project shows how to use low cost 433MHz RF transmitter/receiver modules to build a 5-channel wireless RF remote control system using 2xPIC18F4550 microcontrollers. In this RF project data is transmitted from the transmitter circuit to the receiver circuit using NEC protocol. The NEC protocol uses pulse distance encoding of the bits. Each pulse is a 562.5µs long. This 433MHz RF remote control system has 2 circuits which are transmitter circuit which transmits the RF signals and receiver circuit which receives the RF signals. The following image shows the RF transmitter circuit schematic diagram where PIC18F4550 microcontroller is used. In the circuit there are five (5) pushbuttons as shown, each pushbutton sends a different RF signal code via an RF transmitter. PIC18F4550 internal oscillator is used (8MHz) and MCLR is disabled. The following C code is the full code used for the transmitter circuit microcontroller which is written with CCS PIC C compiler PCWHD version 5.0.51. Receiver circuit schematic diagram is shown below. In the receiver circuit there are 5 LEDs, each LED is controlled by one pushbutton on the transmitter circuit. The RF receiver receives RF signals transmitted from the RF transmitter on the transmitter circuit. After that a function named remote_read() is called, this function checks if the received signal has NEC protocol form all the time with a resolution of 10us then returns the received code. if( (count > 599) || (count < 500))          // NEC protocol? if( (count > 299) || (count < 220))          // NEC protocol? if( (count > 44) || (count < 25))          // NEC protocol? if( (count > 119) || (count < 25))         // NEC protocol? The following video shows a prototype hardware circuit for this project. In this video I used PORTD instead of PORTB for the 5 outputs of the receiver circuit.